Identifying this dolphin is easy. you just look for the bright yellow patch on the rear flanks. This flashes briefly as the dolphin moves through the water. 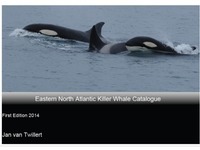 You may also glimps the subtle white band on each side below the dorsal fin, which gave the dolpin the common name. Traveling in groups of up to 100, Atlantic white-sided dolphins are a favorite of whale watchers. The dolphins often accompany whales, they may be feeding on similar prey at times, but for the dolphins, it seems to be more of an opportunity to be sociable. 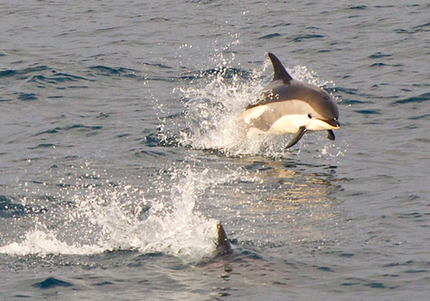 Herds of up to 1000 dolphins have been seen on occasion in offshore areas.